Windows 7 Build 7048 has been speculated as the release candidate version for Windows 7 by many, and there is even fake news that the build has been tagged as RC1. However, as always, there is no confirmation from Microsoft, up until now, which may prove that Windows 7 Build 7048 is, and is not, the RC version, depending on how you interpret the invitation email below. 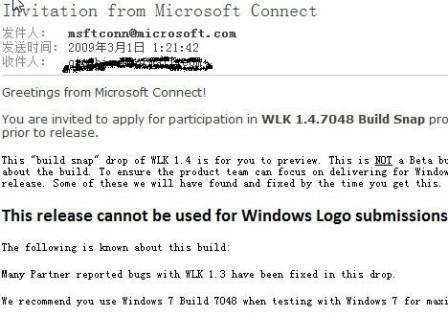 Microsoft has sent an invitation to some of the Windows Logo Kit (WLK) testers to participate in Windows Logo Kit 1.4.7048 Build Snap program. The mail can confirm that Windows 7 Build 7048 which is leaked for torrent download with screenshots, has been compiled, and is valid. Besides, Windows 7 Build 7048 is confirmed to be no longer a beta, and possibly is a RC build, or a build within the RC branch. You are invited to apply for participation in WLK 1.4.7048 Build Snap program on the Microsoft Connect Web site ( http://connect.microsoft.com ). This will be your opportunity to get a good look at WLK 1.4 prior to release. This “build snap” drop of WLK 1.4 is for you to preview. This is NOT a Beta build! Beta implies there was a mini-release cycle around the drop with a modified test pass, and that we are making a statement of quality about the build. To ensure the product team can focus on delivering for Windows 7 RC, we have instead “snapped” a build of the kit, and done some very basic validation. Therefore you will find bugs and problems in this release. Some of these we will have found and fixed by the time you get this. This release cannot be used for Windows Logo submissions! Many Partner reported bugs with WLK 1.3 have been fixed in this drop. We recommend you use Windows 7 Build 7048 when testing with Windows 7 for maximum compatibility. If you are already registered on Microsoft Connect, visiting the link above will prompt you to login with the Windows Live ID e-mail address associated with your account (note that the email address we used to contact you regarding this invitation is not necessarily your account e-mail address). If you are not already registered on Microsoft Connect, visiting the link above will prompt you to register. Follow the steps shown to you by that program to apply to become an active participant. You may be asked to take a survey, or submit other preliminary information. To report a problem or to ask a question, visit the Help page (found at the top of every page). Thank-you for your interest, and we look forward to hearing from you!